I hear all the time from MSPs wondering how to grow past $1M revenue and beyond. The reality is, it’s really hard. It takes time, energy and a never die attitude. In today’s article I’ll give you the secrets to how we grew our MSP from $0 to $8M+ organically over 19 years using referrals, Google Adwords and focusing on conversion. Firstly, let’s be clear on the key business KPIs you absolutely need to know to grow your MSP. 1. What is your Monthly Support Plan Figure? This doesn’t include managed services (e.g. O365, Backup, Internet, Phones) – just support. 2. What is your Churn? How much monthly support do you lose every year? e.g. 10% or $5,000 Per Month based on the $50,000 per month above. The goal is less than 10% a year. 3. What is your Sales Target? Now you know the above you should be aiming to sign up 20% more support deals every 12 months so you can replace the churn and grow. e.g. $10,000 per month. Even if you don’t churn 10% one year, it’s a great sales target. So now you know your Monthly Support Plan sales target, let’s discuss how to win more support deals. There are many ways to grow and lots of marketing options to generate support plan leads. So it can be really hard to decide what to select especially if you’re starting out or trying to break past 5 staff or the magical $1M revenue barrier. You can do direct mail, social, events and outbound tele-marketing to name a few, but there are pro’s and con’s to every marketing method. I’ve tried them all. And time and time again what we’ve found works the best are referrals, Google Adwords and most importantly focusing on conversion. Don’t get me wrong, if you’ve personally had success with other methods, keep doing it and well done. I know a few MSPs that are doing extremely well doing direct marketing, so it can be done. But it’s hard work and can often be costly. So how do you do it with referrals? It’s ALLLLLLLLLL about Customer Experience (CX). Simple. Full stop. Do an awesome job and clients will refer you. Offer a memorable experience and clients will tell their colleagues and friends. It’s super hard to run a referral campaign. I’ve tried, many times. The thing is it’s really hard for a client at the time you ask them to just happen to know someone looking for IT Support. This is why those campaigns tend not to yield a great return. Focus on your CX and you’ll be pleasantly surprised with the referrals you’ll get. Customer Experience is defined as the brand touch points in your business, in other words it’s every interaction you have with a customer. Watch the following video below to learn more about CX, but in short, if you improve all the different areas of your business you’ll get more referrals. To give you an example, we realized email support (support@) wasn’t helping our MSP deliver an excellent customer experience because users couldn’t find it, they often gave us the wrong information and we had to waste their time going back and forth to get the right info. 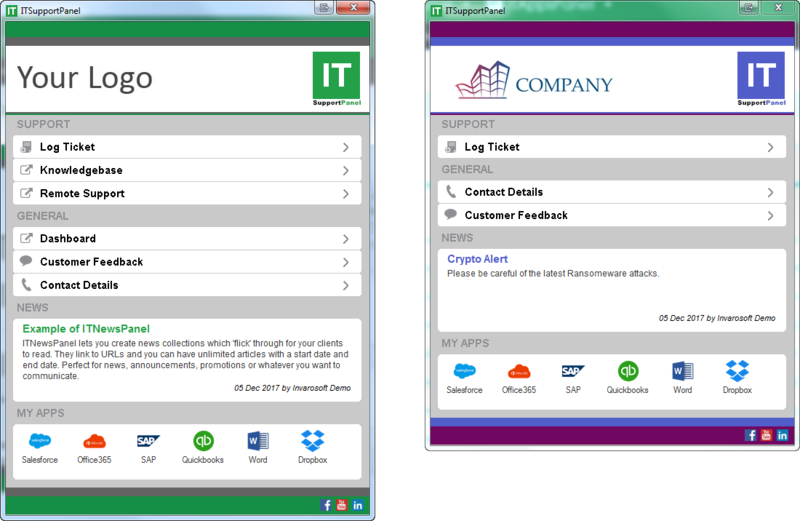 So we decided to replace email support with a ‘one pane of glass’ desktop and mobile App called ITSupportPanel. The result, well, clients loved it . We finally had something showing our visible value every day. Now instead of ‘support@’ clients could go to the one destination to access all of our IT services. We now benefited from getting the right ticket information with ticket type, sub type, client name, user name, host name, form data etc. We loved the fact we could attach custom forms for things like new user requests, send branded push notifications about outages or for on-boarding and set up approvals if clients needed to authorize any tickets before we started working on them. We learnt that if you customize the App for their requirements it suddenly becomes part of their business process saving them time which in turn helps to improve the stickiness of your services and reduce churn. We now get 60% of our 110 tickets a day via ITSupportPanel. How do your ticket stats compare? The point is do you think it’s valuable to have your brand over every device showing your value every day? Absolutely! For example, how do you train clients on how to contact you, perhaps an email, mouse pad, stickers or nothing at all? We train clients by sending them on day (1) a branded push notification and then linking it to a cartoon ‘how to use our services’ video? Do you think they would be impressed? Get my point? What are you doing to blow their socks off on a day to day basis? Make your MSPs CX a Priority! The point is there’s no magical pill here. It’s just about focusing on CX from new business, to on-boarding, to consulting, to projects to reviews etc. Keeping clients happy will always increase referrals and reduce churn. If you’re a new MSP my recommendation is focus on CX from the beginning and then it’s already built into your business model. Read more about why Customer Experience (CX) is the new MSP battlefield. This is my favorite marketing method. I love it because it’s easy to set up, it’s instant, the budget can be controlled and you’re getting warm leads from clients who have an immediate need. We started doing it around 2008 or 2009, so we’ve been using it for approximately 10 years and there is now doubt Adwords has been critical to helping us grow from $3M to $7M. One Ad per set of similar keywords. Set Ads to run during business hours. Only show Ads for Google Search NOT partner network. Ensure you have an excellent website home page. Our stats show most people don’t go past this page so have a clear message which matches your Ad, show clients, testimonials, video testimonials and use ‘real imagery’ of your business. Stock images look generic. Ensure your phone number is easy to access on this page. Track everything with Google Analytics. I hear all the time, I tried Adwords, it didn’t work so I gave up. Well usually it’s either because you didn’t give it enough time OR you didn’t actually measure the ROI properly. This is how you measure the ROI. You have to run the campaign over 12 months to give it a chance and to generate real data, so you’re committing to $6000 or $12000 for the year. Pretty affordable really. You work out at the end of the 12 months how many support plans you converted. So let’s say you signed up $5K (we do around $20-25K) after 12 months then you’re up by $4K if your spend is $1K. That’s pretty good. Now in year 2, you’re still spending $1K and you sign up another $5K. Now you’re up $9K based on the $1K spend. That’s awesome. You marketing cost stays the same (or close to that) and you just keep widening the gap. Righto, increasing conversion of the support leads you get is definitely the final piece of the puzzle. Most MSPs focus all their energy trying to find more and more leads and they’re forgetting to focus on the most important part of the equation – conversion. There is no point focusing all your time on lead gen if you don’t spend the same amount of time on improving your support proposal, your pitch, you presentation to increase conversion. I honestly believe you can grow without increasing leads, just by increasing conversion. If you’re currently getting 4 leads a month and your converting 1 and you increase conversion to closer to 2, then you just doubled your sales! Simple right? Well it’s not that simple there’s obviously a lot you need to do. When was the last time you updated your IT services proposal layout? Do you explain the WHY first, then the HOW and then the WHAT? Do you take them on a journey of what it would be like to work with you? The proposal is the most critical sales device to show a potential client what it’s like to work with you. So spend the time to make it awesome! What do you have in your proposal or services which helps you stand out? The book Purple Cow talks about why it’s so important in crowded markets to be ‘remarkable’. Read more here. We use ITSupportPanel as our Purple Cow and you know what – it works! If you sell one (1) package you will win deals, but not as many as we do. We did one package for 10 years and went to good, better, best. It was revolutionary and absolutely works because the buyer has options (instead of ‘yes’ or ‘no’) making it much easier to negotiate. I recommend a book called ‘Monetizing Innovation’ if you want to read more about this. Righto, here’s my bonus tip to growth. The thing about growth is that it often comes down to speeding up the sales cycle. If you can squeeze more deals into a shorter time-frame then you will grow faster. For example if you had $1 millions worth of product to sell clients, you can do the usual thing of getting to it when you can and only sell $500K in one year OR be more efficient and proactive and make those sales over 12 months. 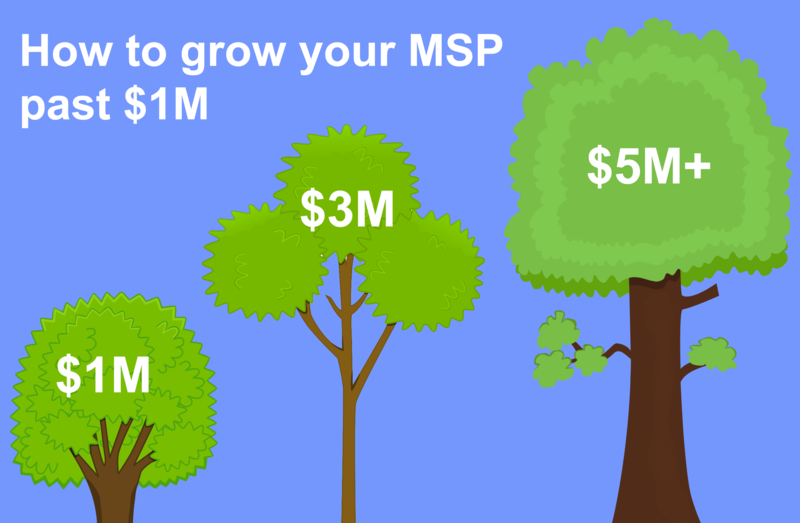 This simple thing is the difference between what smaller and larger MSPs are doing. You need to ensure you’re doing regular IT Roadmaps with clients to grow then harvest your sales pipeline. It’s basically a ‘customer success’ meeting and covers your service experience and their IT requirements. The more regularly you do this the faster you will uncover opportunities to sell more infrastructure. We run a Dell Group Buy Campaign every year which helps clients replace their older workstations. They get a massive discount, we earn huge margin and the vendor is happy also. It’s win, win, win. If you have 500 devices under management and 10% buy that’s 50 devices at $2000 each which is $100,000 in sales. Not bad. If you’re turning over $1M then you just grew by 10% from one campaign. The good thing is you can do it every year since every year 20-25% of the devices become four years old. Focus on Customer Experience (CX) in everything you do. Invest in a ‘purple cow’ CX platform like we do in ITSupportPanel. Ensure you’re selling Good, Better, Best. (Invarosoft partners get trained on how we do this). Run a Workstation Group Buy Campaign every year. Good luck. I hope you found something in this article helpful and I wish you all the very best along your MSP business building journey!